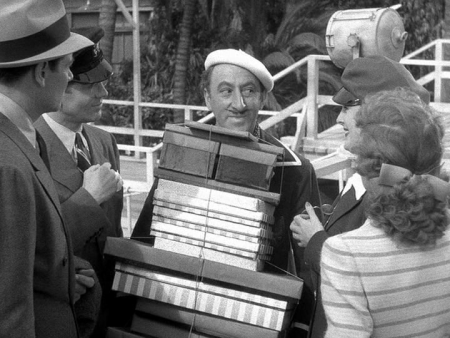 But deep in the third act, determined to marry Captain McGlue (“That name!”), the Princess feels stronger measures are required to deal with Toto and proposes buying him a one-way ticket to Havana. This calls for a refusal in stronger terms, it seems: no mere “Nitzk” will do. “Yoag, Toto,” says the Princess, equally firmly. The porter’s on the poster! Somebody noticed how good Charles R. Moore was! And also! A New York cabbie (Frank Faylen! Bim from THE LOST WEEKEND! 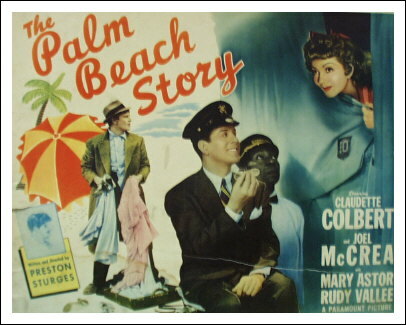 ), after Claudette Colbert asks if he can possibly take her to Penn Station for free: “Sure, hop in, babe.” It’s the micro-pause before he delivers it, since this is an unusual request and he has to give it a moment’s thought, and then the casual way he says it, since after all it’s no big deal, that for some reason makes it (1) totally convincing in real-world terms and (2) hilarious. The film is full of gleeful silliness, like the repeated Deus Ex Weenie King plot contrivance, but that moment is oddly convincing, despite its highly irregular nature — it also neatly illustrates the film’s underlying theme, what Sturges called “the aristocracy of beauty,” explained by Colbert’s character as the principle that a pretty girl can do a whole lot without doing anything.